Why birdwatching at Sultanpur National Park in Haryana will never be the same. Sunrise at Sultanpur National Park. Easily, one of the most difficult things about birding is having to wake up at some godforsaken hour in the morning — well before dawn — and go driving off, half asleep, in a car rapidly steaming up with halitosis. But then, at last when you reach your destination, it suddenly becomes worth it: the air is salad-crisp and cool, the silence of the pre-dawn is just being punctuated by the first flutings of birdsong, and there’s a golden-orange glow in the east as the sun wakes up too. 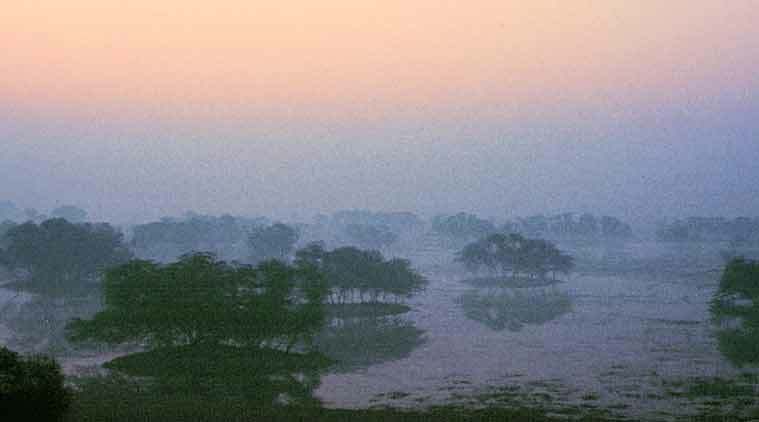 One such place where I’ve enjoyed dewy dawn mornings for over the last 30 odd years was the Sultanpur National Park near Gurgaon in Haryana. Back in the ’80s, it was just a seasonal rain filled depression (jheel) surrounded by flats and fields that, after a good monsoon year, attracted a host of migratory waterfowl in winter. It was soon promoted to sanctuary status and years later, was declared Haryana’s first National Park. It’s tiny by national park standards, with a core area of just 143 hectares, but attracted over 320 species of birds. It’s been through major topographical makeovers, trees have been planted, islands (for nesting colonies) created in the lake in order to give big boss rival Bharatpur a run for its money. It was fenced (unfortunately, they also blocked off the free ingress of water from the surrounding areas) and saw many ups and downs over the years. For simple birders and crack ornithologists (who can gun down “little brown jobs” at 250 metres with one eye closed) and earnest researchers, it was the perfect place to hone skills. You got there just before dawn and could perambulate slowly right around the lake in about three hours. I did this with friends regularly every month for over a year, monitoring the changes brought in by the seasons — and every trip produced its surprises — like takeaway gifts. The one major unpleasant aspect was that when you got back to the “interpretation centre” and tourist resort, it would be full of raucous picnickers from Delhi and Gurgaon whose chief aim in life seemed to be making a nuisance of themselves and causing as much disturbance as they could. Of course, they all had uncles in Parliament so nothing was done about them. Still, for people from Delhi, Gurgaon and the surrounding areas, Sultanpur was the perfect place to encourage the love of nature in general and birding in particular, something which our youngsters are exhorted to do time and again. To this end, what do the authorities at Sultanpur do? They declare babu hours for the National Park: 9.30 am to 5.30 pm and yes, there’s a weekly off day too. And an annual vacation from 1 May to 30 September. Yes, many parks close down during the monsoons (because the roads are impassible) but most remain open between dawn and dusk. Methinks some bird (who has an uncle in Parliament) has been making mischief and has complained: I mean if you were a bird, would you like to be gawped at by a bunch of badly-dressed people first thing in the morning, who point fingers at you and call you all kinds of names (Bubo bubo!) and then start fighting?